I thought it would be interesting to juxtapose watercolor illustrations of claims about food politics with images of food waste. I chose to curate my fact checking site in this manner because it catalyzes a dialogue about how waste can be re-appropriated and re-imagined as a resource. It also exposes the critique of the understructure that Dive! 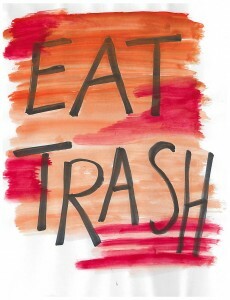 explores: we typically associate the term ‘waste’ as that which should be hidden from society; normatively negative. What if we were to reverse this framework and look at waste as art? What if we saw food waste as a source for life? The critical theorist Slavoj Zizek defines waste as “a parallax object. That which disturbs the smooth running of things.” By literally contrasting images of art with images of ugliness I hope to encapsulate the main themes of the documentary in one cohesive multi-media form. I also chose to curate the project in this way because I think that the true essence of documentary is the compelling presentation of a subjective truth. Most documentary filmmakers are hyperconscious of the deep perspectivism that their work entails. The purpose of fact checking is to illuminate and contextualize statistics and arguments on a spectrum of truth, not necessarily to show their validity on merely a true/false binary. The notion that we evaluate the validity of claims based on a subjective prioritization of social goods is demonstrated perfectly in an analysis of the environmental impact of food waste in Dive! Seifert argues that the environmental impact of food waste might be significantly greater than we imagine. 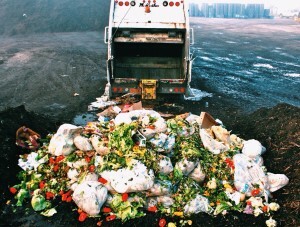 A single pound of wasted meat does not just result in one pound of food waste. Since, on average, 7 pounds of grain is used to produce 1 pound of meat, the resulting food waste should actually be calculated as 7 pounds. Now of course, the validity of this claim is based one’s outlook on the importance of production. Both statistics could be valid, dependent on an individual’s view of the relevance of production processes on environmental impact. To summarize: this project aims to contextualize claims made in Dive! rather than to validate them or invalidate them. It is ultimately up to the reader to evaluate the weight of claims made in the documentary using their own normative frameworks. All illustrations on this site were created using watercolor and sharpie. All pictures are cited via hyperlink. I have reprocessed them with VSCO pre-sets.